Mozilla announced Wednesday that it is expanding its Test Pilot experiments to mobile devices. The Test Pilot program launched in May and has had a number of experiments, including two successful desktop experiments so far. Accordingly, Mozilla is bringing the feature to mobile with two experiments for smartphone users. The first experiment is for iPhone only. Called Lockbox, the app syncs with your Firefox account and makes all your saved logins available on your iPhone. That means you can use saved logins from Firefox to seamlessly login to apps like Twitter or Instagram. Furthermore, Lockbox utilizes Touch and Face ID to secure the app. Along with Lockbox, Firefox Test Pilot has a treat for Android users. Called Notes by Firefox, its a Google Keep-like app that allows you to save quick and simple notes. While nothing too fancy, the strength comes from its synchronization with Firefox. Uniquely, Firefox allows Notes to run beside the website you’re viewing in Firefox on Desktop. It’s a handy feature that allows you to take notes on a webpage without having to change tabs or switch apps to use your notes. Unfortunately Notes on Android doesn’t benefit from this. Instead Firefox siphoned it off into a standalone app. Additionally, Firefox boasts end-to-end encryption for it’s Notes app, making it quite secure. If you’re interested in either of these features, you can go to Firefox’s Test Pilot website to learn more about them and install them. 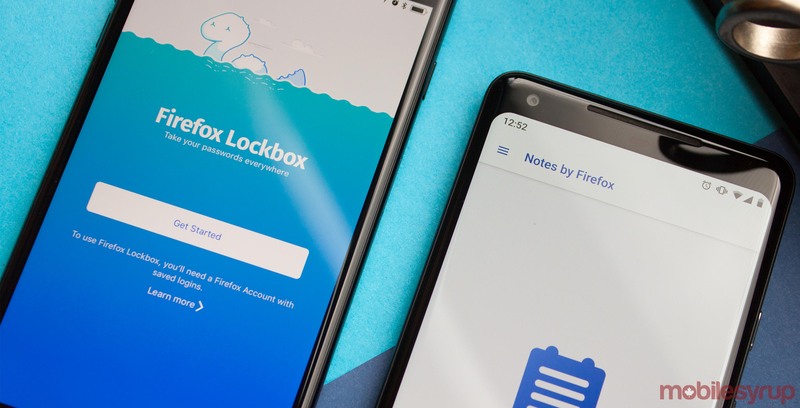 Alternatively, you can go to the App Store to download Lockbox and the Google Play Store to download Notes for Firefox. Additionally, the Firefox team has been working hard to develop new experimental features for desktop as well. They recently released a popular tool that lets users customize the colours of their Firefox browser.